Holy Father will act on the recommendation of the Council of Cardinals. As the Council of Cardinals meets in Rome this week to discuss reforms of the Roman Curia, it was announced by the Vatican that the Holy Father will establish a commission for the protection of minors, as recommended by the council. The new commission, which will include lay people as well as priests and religious, will advise the Pope on the prevention of abuse and the protection of young people and also the pastoral care of victims and their families. “Continuing decisively along the lines undertaken by Pope Benedict XVI, and accepting a proposal presented by the Council of Cardinals, the Holy Father has decided to establish a specific Commission for the protection of minors, with the aim of advising Pope Francis on the Holy See’s commitment to the protection of children and in pastoral care for victims of abuse. 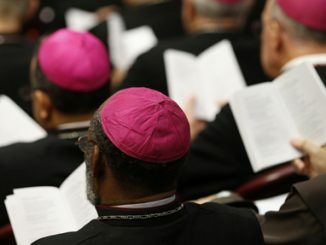 Specifically, the Commission will study present programs in place for the protection of children; formulate suggestions for new initiatives on the part of the Curia, in collaboration with bishops, Episcopal conferences, religious superiors and conferences of religious superiors; and indicate the names of persons suited to the systematic implementation of these new initiatives, including laypersons, religious and priests with responsibilities for the safety of children, in relations with the victims, in mental health, in the application of the law, etc. [O’Malley] went on to mention lines of action for the future Commission: guidelines for the protection of children, the development and extension of norms, procedures and strategies for the protection of children and the prevention of abuse of minors, educational programs for children, parents, and all those who work with minors, guidelines for catechists, and for the formation of seminarians, the ongoing formation of priests, protocols for environmental safety codes of professional conduct, proof of suitability for priestly ministry, screening and checking of previous offences, the state of action of requests for psychiatric evaluation, co-operation with the civil authorities, reporting of crimes, compliance with civil law, communications regarding clergy declared guilty, pastoral care for victims and their families, spiritual assistance, mental health services, collaboration with experts in the research and development of the prevention of abuse of minors, psychology, sociology, legal sciences; collaboration with bishops and religious superiors, optimization of procedures, implementation of laws and guidelines, relations with the faithful and with means of communication, encounters with victims, supervision and rehabilitation of clergy guilty of abuse. Answering questions from reporters, O’Malley said that the commission’s goal will be to provide local bishops and episcopal conferences with guidance on issues surrounding the abuse of minors and to identify “best practices.” “We hope that the Holy See will be able to model what those best practices are as a way of helping other dioceses and bishops conferences to have a response that is truly adequate and pastoral,” he said.